Established since 1951 by the French Family, we have now grown into one of the largest marine specialists in the country. We specialise in all aspects of Marine engineering including the supply of new marine engines, reconditioned marine engines, spare parts, propellers, stern gear and engineering chandlery. Our well stocked and equipped facilities allow us to provide you with a one stop solution to all your marine needs. The two French brothers Verden and Colin took over an existing Marine engineering Bureau and renamed it Marine Motors. Over the years, the business took off with various changes of personnel and buildings to its presents location. 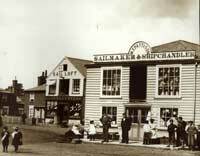 Situated at the top of the Hard at Brightlingsea, where the Marine Chandlery, engine workshops are based. The machine shop is 50 Yards away in Tower Street. Two French brothers are still at the helm Michael and Chris French ably supported by Mrs. Joan French one of the co-founders of the company. The business has now grown from being a small company in Brightlingsea to an East Anglian based company with sites in Titchmarsh (Walton-on-Naze), Levington (Ipswich) and Rackheath (Norfolk Broads). French Marine Motors now carries out work all over the country and other parts of the world. Through this expansion one constant factor has driven the company, our belief in quality service and support.